AHHHHHHHH** Exciting memories! 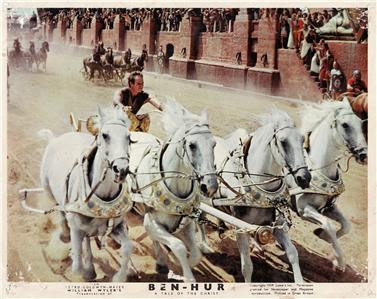 Ben Hur's famous chariot race & Charlton Heston one of my high school movie star heroes & graduation diploma presenters. I've Been tagged by John Randall York & Carolee Clark, encouraging friends, accomplished artists & accomplished musician (JR) to write 5 Random Things about myself. 1. My Christmas water color painting of a log cabin, snow topped mountains, snow tipped pine trees & reindeer was chosen in my elementary school as the Principle's Award Winning Number One favorite art work of the year. 2. I started teaching piano at age eleven & skate boarded to my students houses with a briefcase filled with music books balanced on my head. 3. 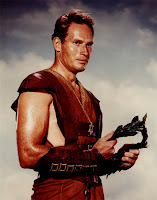 Charlton Heston was our High School's graduation commencement speaker because I was head of my senior class steering committee with my friend who's father's best friend was Charlton Heston & we begged Ben Hur himself. Very little begging, Moses AKA Chuck was thrilled. 4. Besides piano teaching, I did Paris Original runway modeling to pay my way through college. No, not in Paris, a term for high fashion five minute cat walks. 5. I was on the NBC reality TV show FANTASY, hosted by Peter Marshall & Leslie Uggams where I won a Lynda Carter Wonder Woman Look Alike contest. 2. Link to your Tagger. This is a wonderful PR tool for the GOOGLE search engines. HENCE THE NAME TAGGED! This reciprocating Tag means PR both ways, which in turn means more visitors & possibly more business for the entrepreneurs. *The INTERNET TAG GAME is a clever way to social network promotional (PR) links. It's a good thing! I have read some added Random 5's 'Part 2 Or More' & they were GREAT! I've already met a wonderful author from this indexing & interesting game. So TAG ON EVERYONE, this really is the Internet's TELL A FRIEND! Very cool about winning the Wonder Woman contest. And Wonder Woman indeed to be teaching piano at such a young age! Take care & have a GREAT week!! Thank you for the sweet post Carolee. Teaching piano was more lucrative than baby sitting at age eleven. Years later one of my piano students sent my photo to the NBC studios & I got this amazing call to come on the FANTASY show & let the studio audience guess what celebrity I looked like. Maybe someday I'll make a YouTube video of my fifteen minutes of fame. I have the VHS video of the Lynda Carter Wonder Woman show segment, I'll have to convert it to DVD. *The INTERNET TAG GAME has been around since there was an Internet. Tagging is a clever way to social network promotional (PR) links. It's a good thing! *Sharing your Random 5 on your Tagger's Blog is optional. Only if one was so inclined, all one would have to do is add their Random 5 to their Tagger's Blog comments. *Remember if you keep getting tagged & you're very busy at least your RANDOM 5 are good to go again & again. This helps to promote you on Blogs & the GOOGLE search engines, etc. & when names are linked this assures more fans your way. *See: TAG YOUR IT! for complete info. *As a final footnote one should not personally Tag someone twice unless they are Tagging other Blogs (meaning other Blog Websites). Hi Chris, thanks for your kind words. It was fun randomly going down memory lane. I see you are becoming a cat... Isn't the glitter & graphic animation just magickal? Makes the Blogs come to life! And you have never been to a zoo? I have been too many times! Okay My turn! I will post 5 things about me asap! Thanks Lyndy and Becky... Been tagged by you both. Sure hope I did it right...put on my 5 random things about me.... should I have put something else? Thank was fun...and great fun reading everyone elses groovy info.! I'm thinking that you have had a more exciting past than I have.... And did you know that Wonder Woman was my childhood hero?!.... I wore the under-oos and spun around playing the part when I was a bit younger..... he he.. But I certainly could not have won a wonder woman look-alike contest, that is for sure! Hi John, THANK YOU so much. I think I'll coin the phrases: Oh My Blog: OMB & Born To Blog: BTB. I have been studying statistics on Blogging & I am finding out amazing facts. I'll have to write a special little post to my December Blog all about my research. In honor of your Zoo Upbringing I'm going to add to my lifetime list of Goals & Dreams a visit to the Los Angeles Zoo & Botanical Gardens which is also part of the newly renovated Griffith Park Observatory. Gorgeous Suzanne, your Random 5 is a fantastic read. Of course you were an artist/illustrator's costume model & you still could be! I knew we had many things in common. Both former models, Native Californians, my husband along with his main computer business & career is also an antique dealer & my partner in Cool Collectibles. You & I have celebrity clients & friends. AND you & I have FUR BABIES (some found us too) & I'm assuming no children. All I can say is WOW! Sounds like you had a very interesting life with many more incredible chapters to live & write! This was great fun & you did an outstanding annotation. Lyndy! Thanks so much again for buying my Christmas CD! I hope it helps make the season bright! Have you thought of broadcasting on the internet? Or maybe an occasional pocast...oooo, I know, "EHAG Live!" Interviews with Halloween artists! You seem like you would be a great host- your blog almost seems like a "channel" or program, it is so entertaining. Anyway, it is great to chat with you and keep in touch! Hi Jodi, or should I say LEGS. I'm sure you still have knock out legs. Louie Armstrong making sure your Dad named you Jodi was just amazing. Pisces women are extremely fascinating. Your Random 5 is very entertaining. Your memories are great & I'm sure you could have written more than just 5 Random things, I know I could have. Yes, there is one more thing: What this all about are the LINKS. I received new viewer emails from this Random 5 & a wonderful author contacted me. Very exciting & to think it happened because of interlinking through this fun Random 5 Post. So you need to finish your great Random 5 with the links, just see my Random 5 again for the details. It's all about promotion for you & your friends that care about you. 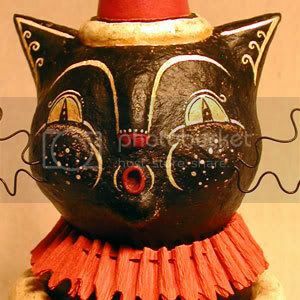 Hi Sandra, wow I just surfed over to your Blog & I will make a cup of herbal tea & have a whimsical read. In the mean time, your SELF PORTRAIT is indeed a little folly for our lives. You truly have 'Artful Visions & Inspirations' What fun your Blogsite is. Thanks for stopping by & posting! Like I posted on your Blog, I could not stop myself from tagging you because I just knew you had a wonderful past & now you're entering an even more wonderful future. You do have a very interesting Random 5. Congrats on the Emmy Award. VERY COOL! That must have been exciting. I bet you were a darling little Wonder Woman for Halloween too. I'm a little late with this, but thanks for tagging me! My life hasn't been as exciting as yours (and others) but I did list my Random Five on my Blog. Boring, to say the least! I love reading your comments and stories! You really go all out when it comes to your art creations. Your art is definitely a treasure that only defies others to achieve to. Hey Bloggers follow this link & check out Becky's Beauties in her eBay store! John, for obvious reasons you should sell you Christmas CD on your eBay Auctions. Also, you should do a YOUTUBE video of your artwork with this CD playing in the background. Don't forget the video credits can give purchase info &/or your website with info. It's a tremendous amount of work, but that's what self-promotion is all about. Every ARTIST, that means Writers, Artists & Musicians need to stand on their own merits by getting their name out there. In the long run this means YOUR NAME as an individual artist is what really counts! Now that you're self promoting through the 21st century's Internet of instant communication JOHN RANDALL YORK's art & music will live on forever. It's amazing, isn't it?